Please also see Experimental G-Format Decodes and the associated PDF article for more on how to play the sample and how it was produced. Nimbus Records has been producing high-quality Ambisonic recordings from the beginning, and for far longer than anyone else - in fact, since 1972. However, they suffered many of the same problems as we did when it came to capturing the recordings, especially when digital recording techniques became available. Like us, they generally had to record on 2-channel machines, and as a result only the 2-channel UHJ versions released by the company over the years have been available. However, unlike us, Nimbus has been able to record in B-Format from time to time. In the earliest analogue days, Nimbus recorded in Ambisonic B-Format (and sometimes A-Format, ie capsule feeds from an Ambisonic microphone array). Today, the company is regularly making high-quality B-Format digital recordings, which are being released on Compact Disc in UHJ. 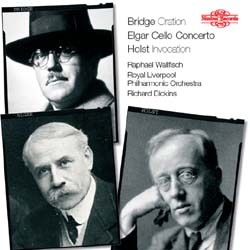 "These three notable British works for cello and orchestra from the early 20th century – two of them, the Elgar and the Bridge, ranking among the finest for the medium ever written by British composers – are linked by various strands, both circumstantial and expressive. All were first heard at Queen’s Hall in London, and all in different ways treat the cello as in some way symbolic of the human voice: singing, lamenting, calling, making a passionate statement with deep personal significance." The CD release is, of course, a UHJ-encoded disc. However, Crac Downes, of Nimbus, very kindly allowed us access to the original B-Format recording and we processed it via our B-Format workflow described elsewhere, including sample-rate-converting the material from 48 kHz to 44.1 kHz sampling for the DTS-CD (it was originally recorded with DVD in mind). We used our standard decode settings, ie we decoded to a square 4-speaker layout with shelf-filters using the Meridian decoder app, set to Row A, which we have found gives the best and most broadly compatible result. For more on the considerations behind these settings, in which we concur 100% with Nimbus's findings, and for background on Nimbus's recordings, please see this page on the Nimbus DVD Music releases. We also retained the 24-bit resolution of the original B-Format master, as the DTS-CD encoder allows up to 24-bit audio to be encoded. We think the results are stunning, and we are very pleased to have been given permission by Nimbus to present a short excerpt from this recording in DTS G-Format form for you to experience it for yourself. On this occasion we have provided two files to make playback as easy as possible: a DTS-WAV file designed for burning to CD to create a DTS-CD, and a raw DTS stream - actually created by using the Hypercube wav2dts tool. Both play perfectly in the VLC Media Player. The excerpt is the first three minutes of the Elgar Cello Concerto, and we think you will agree that this fine recording benefits immensely from being presented in this way, as a surround decode from the original B-Format. Note that this is a commercial recording and is made available here for private study and review only. It must not be used for any commercial purpose without the permission of Nimbus Records. Nimbus, understandably, believe that releasing a DTS-CD of this album would result in confusion in the marketplace, and the obvious alternative, a 'Double Disc' package containing the regular UHJ CD and the DTS CD, would not be viable as a one-off release at this time (especially as the CD is already out there). However it is possible that a sampler will be issued in due course containing a number of items presented in this way. If you would be interested in purchasing such a disc, please let us know and we'll pass the information on. We would also like to hear your comments on this sample. Do you think that G-Format material like this should be released on DVD-Audio/Video, DTS CD or some other PCM-based format?